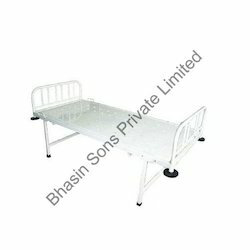 With innovative and focused approach, we manufacture and export a wide range of Hospital General Ward Bed. We monitor the quality control process with utmost care to deliver defect-free products to our clients spread all over the world. It is impeccably featured with locking facilities such as, adding and removing the wheels for the expediency of the patients. Our product is found almost at all hospital general wards. Overall Size: 187 x 60W x 45H cms. H type legs on PVC stumps. Backed by the sound state- of- art infrastructure, we offer Plain Bed with Backrest. We manufacture these rods using high-grade stainless steel materials that are in compliance with global Quality Standards. This type of bed is controlled manually. Majority of the dispensaries use this type of beds. This model is used to admit patient as an inpatient and for even outpatient purpose. 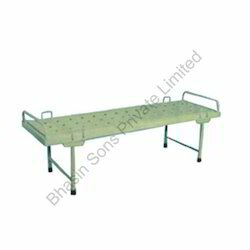 This type of bed is specially designed for the patients to take rest and to give small treatments. 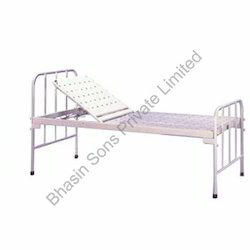 Under able guidance of our skilled professionals, we offer Plain Bed General Dx. This product is manufactured with premium quality stainless steel materials which gives a durability and long lasting life. These products are specially designed for the convenience of physically disabled and handicapped patients. The knob adjustments attached at the four ends enables the user to increase or decrease the height. Our products are found at both government and private hospitals.